How often do you read the news? Do you start every next day with a portion of fresh updates on the topic that is of the greatest interest to you? Do you prefer printed newspapers or you opt for the contemporary digital press? If you choose the latter and search for the ways to keep the audience always informed on the latest topics in your niche, then the following compilation is just what you are looking for. 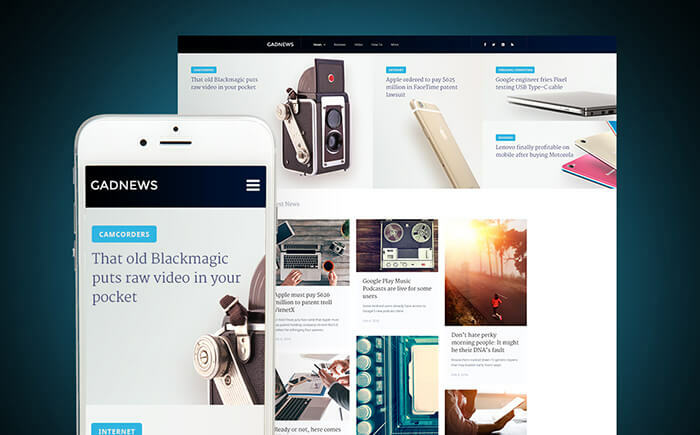 The below-listed ready-made media WordPress themes can not only inspire you but also serve as rock-solid foundations of a number of blogs, online magazines, and newspapers. All of the ten hand-picked ready-made designs were taken from TemplateMonster inventory. Their collection of WordPress themes includes over 1,000 ready-made solutions for some different purposes and business niches. I ran detailed research and selected only those themes that are of the biggest demand among the web audience and are best suited for creating content-rich online projects. All themes run on Cherry Framework. Most of them are GPL licensed, which gives you the complete freedom of their use and modification. There are no additional licenses and agreements required to install them on 2 or more online resources. The themes are pre-loaded with a number of smart customization options and a number of impressive visual effects, allowing you to enjoy the speed at which your project launches, as well as make its visual presentation more appealing. The best thing about all of the given templates is that they can be handled even by those users who are taking their first steps in web development. Intuitive drag-and-drop page builders are included to speed up and facilitate the process of the themes’ personalization. Detailed documentation and free 24/7 support are do you like in the pack of every theme from the list. Whenever you need more help on the customization of the themes’ designs, you can also make use of these free video tutorials. If you need a qualified piece of advice on how to make your startup more effective, you can always refer to Startup Hub. If launching a site on your own isn’t exactly what you are looking for, you can always ask qualified freelancers and web design agencies for help. TemplateMonster has launched a certification center that checks the knowledge of studios working with their themes and lists the most professional ones on the Web Design Studios Catalogue. In such a way, you can select any theme from this showcase and be certain that it will be adjusted to fit your project in a pro way. Below are my top pick themes from TemplateMonster for Media WordPress sites! 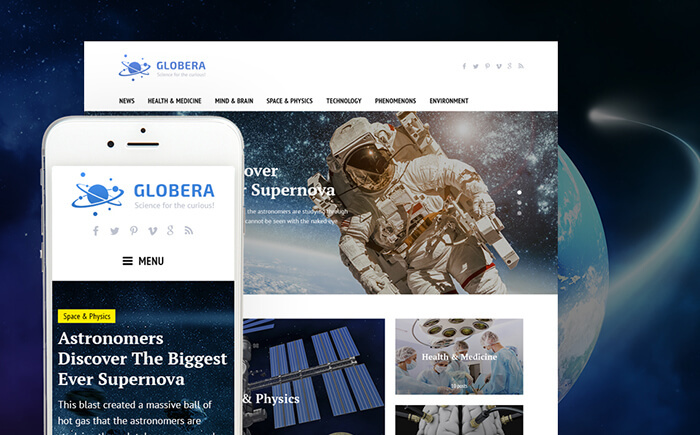 If you are looking for an up-to-date template that will give your site a high-quality look, then consider this GPL licensed WordPress theme. The template’s structure, plain yet professional, lets you apply it to almost any content-heavy web project. It will work for blogs, news portals, and online magazines perfectly well. This web template will be useful to make a user-friendly design for your website. Due to the clean page layout, your web resource will appear reliable to the customers. Fully featured and 100% responsive, it includes every element that you might need for an easy to scan through web project. Make use of this theme for building fashion and beauty related blogs. Designed with the focus on content, it is best suited to communicate your ideas in a clear and comprehensive way. Best suited for information-heavy web resources, it boasts numerous blog templates and post formats, and as a result, it can be utilized as a basis for a niche blog. This is one of the best media WordPress themes that can display flawlessly on a multitude of electronic devices and display resolutions. If you have any questions regarding website design use you can take a look at the detailed documentation, also you get 24/7 priority assistance aiding to get rid of any trouble. 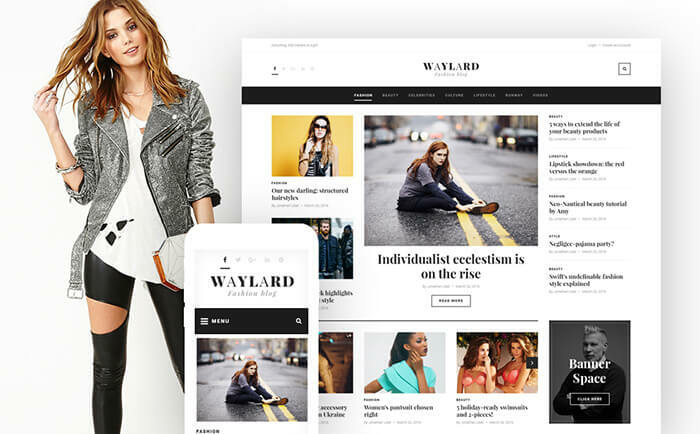 Waylard is a fully editable template featuring WordPress Live Customizer. With its help, you can build versatile layouts on-the-fly. All results of the customization are shown in real-time, which frees you from the necessity to wait until all changes do you like and the page re-loads. This is a well-coded and good-looking solution for people who intend to establish a user-friendly web project. Make your web project recognizable on the web by simply applying some changes in the admin panel and it is ready to go. A descriptive documentation file, as well as free round-the-clock assistance, are bundled. This GPL-licensed WordPress template runs on a complete responsive Bootstrap framework. 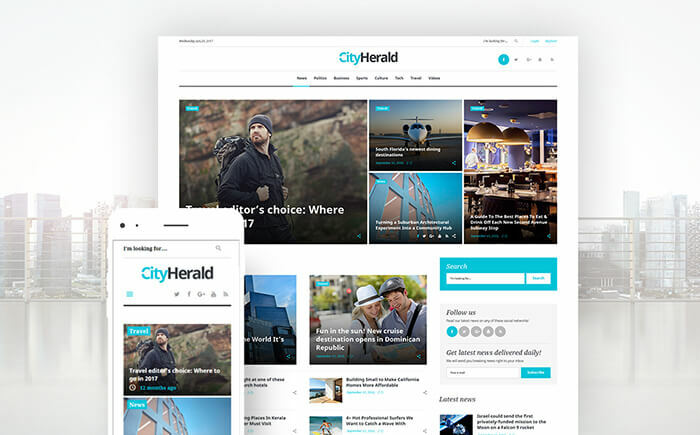 This Media WordPress theme enables you to develop a professional and influential blog, magazine or news portal with a classy design and unequaled functionality. The theme was coded with valid HTML and CSS practices. The theme’s layout is quick and easy to tweak. The pack includes a variety of modules and widgets, making it so much easier to bring the desired look and feel to the template. The clean and minimalist design of this template is enhanced with WordPress Live Customizer, providing for its quick and effortless modification. Taking into account the growing demand for using handheld devices for browsing the web, the theme runs on a fully responsive framework. It is best suited for building a variety of business and financial blogs. Detailed documentation and free round-the-clock assistance are included in the theme’s pack. Building a website from scratch or updating a current one can end up simpler and easier using this 100% responsive WordPress template. It is ready to launch scientific and education web projects out-of-the-box. Being integrated with popular social media platforms, the theme presented here will be a great solution to get in touch with your customers. Thanks to a wide range of customization options and plugins, it can be completely redesigned or adapted to any other project lightning-fast. As a result of well-balanced design structure, your targeted traffic will be able to locate the relevant content quickly. Clean, valid code and rich guidance will help you in adjusting this template the way you want. 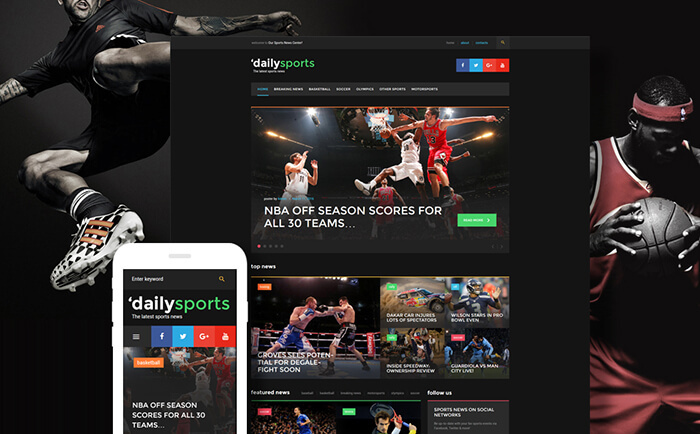 The theme is built in dark tones, bringing a more masculine and powerful look to sports-related blogs and online magazines. The theme is integrated with WordPress Live Customizer. It can be handled by users of all skill levels. Tweaking the theme’s layouts is as easy as just dragging and dropping different elements. The availability of a number of pre-designed page templates, layouts, widgets, and working forms makes it so much quicker and easier to get started with a versatile presentation of your project on the web. Use this theme for blogs and news portal highlighting all the things related to electronic gadgets and devices. It runs on a fully responsive framework, which makes all content that you share perform flawlessly on a variety of screen sizes. 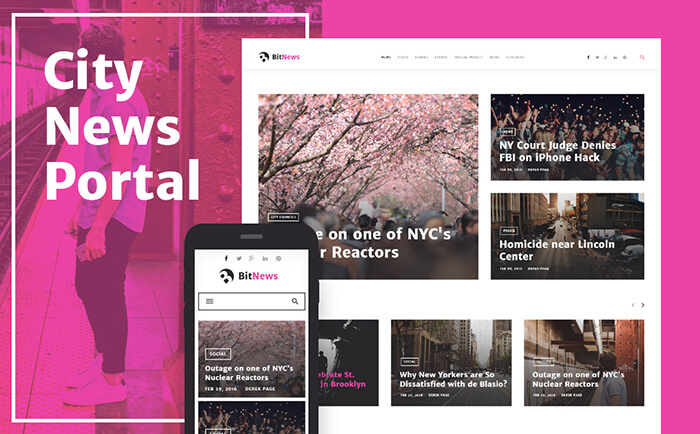 This is one of the handy media WordPress themes as it is quick and intuitive to handle. By simply dragging and dropping different design elements, you can bring the desired look and feel to the design. GPL license provides the freedom of the theme’s installation on an unlimited number of online resources. 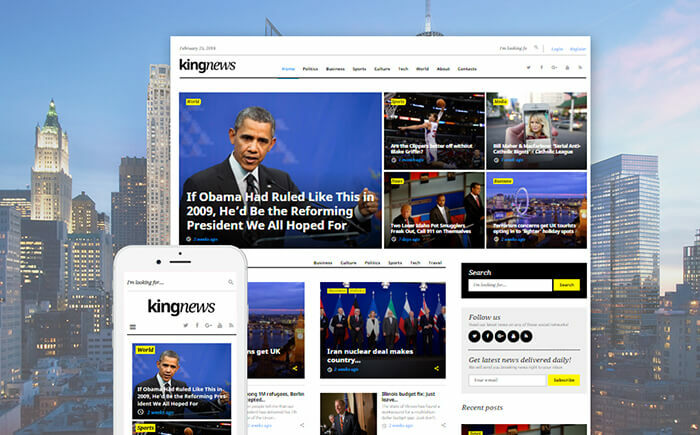 This media news WordPress design can be a powerful foundation to boost your project online. The theme is designed for content-rich web resources. In addition to a number of customization options and cool animation effects, the layout is also richly documented and comes with skilled 24/7 tech support. If your goal is building a good looking online venture, then this classy website design is just the thing you need. This fully-featured, 100% responsive WordPress template will is designed and developed to make it easier for you to start or revamp an already existing site to meet your requirements. 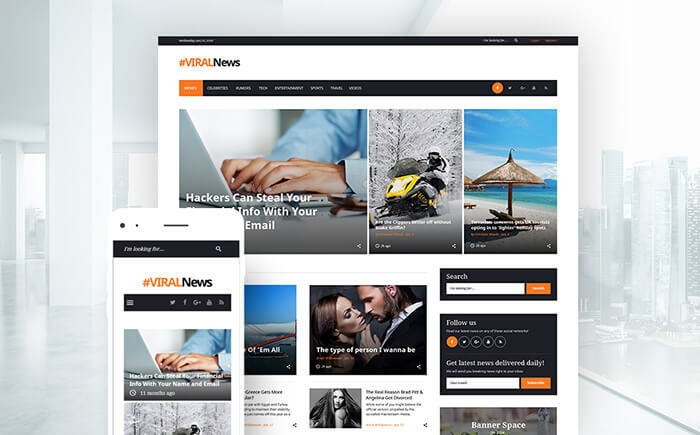 It is a fresh, laconic and easy to personalize theme specially created for media sites and news portals, but it can also be implemented for some other business or personal projects. It has a conveniently structured menu bar which lets you find whatever you need in a couple of mouse clicks. Richly documented and presenting cost-free 24/7 assistance, this web theme will allow you get moving with your web project right away. 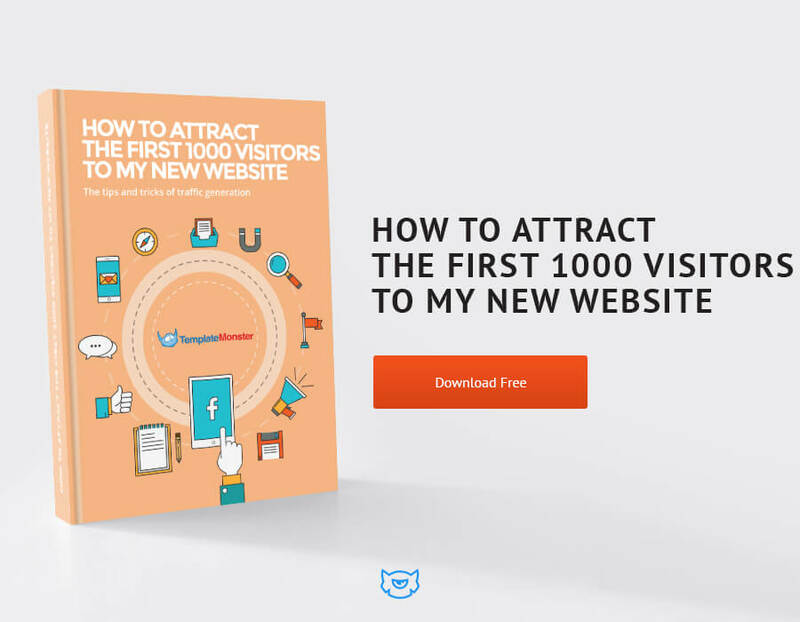 Just in case this is the first web project that you’ve ever created, then the following free eBook will help you make it more successful at the launch. I hope that you found the right design for your online magazine from this showcase. 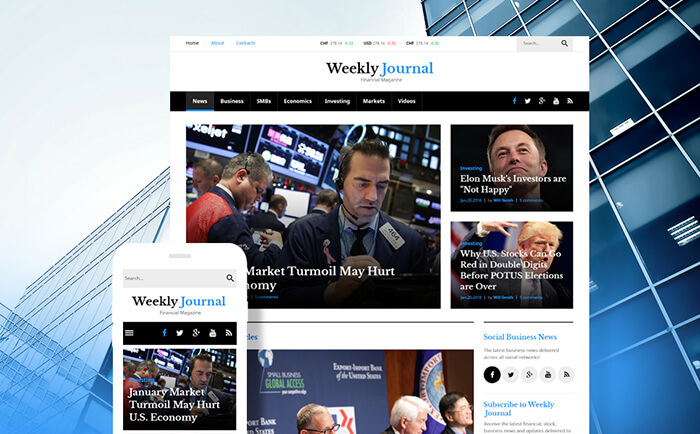 Do you like these media WordPress themes? Which one do you like the most? Share your views in the comment section. Awesome Collection of themes for News and Blogs. I went through all of them BitNews and KingNews are awesome. Beside these themes I would also like to suggest smartmag wordpress theme.